What’s Better than One SmartLab Diffractometer? Two! Sometimes one of a good thing is not enough. 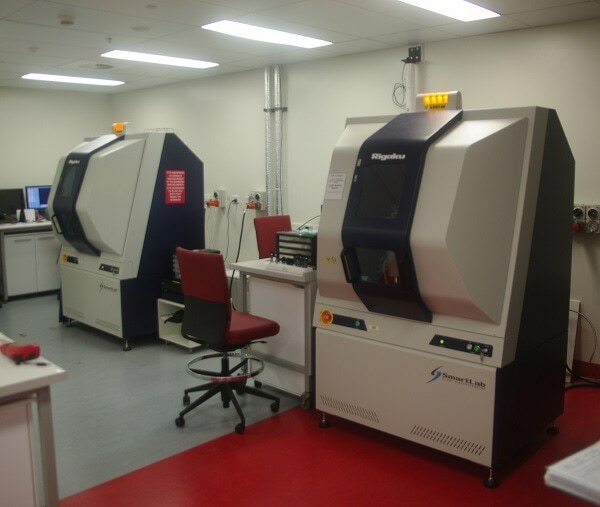 In this case, the Central Analytical Research Facility (CARF) at Queensland University of Technology (QUT) has just commissioned a pair of Rigaku SmartLab X-ray diffractometers to cater for their demanding requirements. Following an exhaustive selection process led by CARF Project Manager Tony Raftery, his team chose the Rigaku diffractometers which lead the market with ease-of-use and versatility. The ease-of-use is mainly attributed to Rigaku’s Guidance software that helps users design experiments and the required configuration changes. The optically encoded attachments and smart cabling, making the systems as student-proof as possible were also key factors in winning the bid. Although the two systems are basically the same and co-located in the same lab, they are destined to lead somewhat different lives. One system will be dedicated to routine work and is equipped with a 48 sample auto changer that facilitates high throughput and unattended operation, however some of the capability of the second machine such can also be transferred across. The other SmartLab will be used primarily for research support purposes where it will be used in various different configurations to perform studies under a range of different experimental conditions. It includes a range of different attachments that allow dynamic studies to be carried out at cryogenic and elevated temperatures as well as vacuum, inert, air and other controlled gas environments. A host of other stages will enable other detailed studies to be performed including thin film analysis. Both systems are equipped with the latest generation HyPix 3000 Hybrid Pixel Array Detectors (HPAD). These ultra-high speed detectors will enable measurements to be carried out as quickly as possible while at the same time offering high spatial resolution. HPAD detectors are based on semiconductor technology and hence generate no noise, while offering high spatial resolution. The benefit of having twin systems is that the attachments can be used on either sibling according to demands with other attachments also available to further expand their analytical capabilities down the track. Furthermore, the user interfaces are the same, so no additional training is required. Both systems were installed and commissioned in July. This included advanced user training carried out by a Rigaku Applications Specialist from Japan. Users are now queuing up to put the SmartLab diffractometers through their paces as they investigate a range of new and exciting materials. Areas of research include, solar cell materials, advanced materials for batteries and supercapacitors, as well as high performance and corrosion resistant materials. AXT represents Rigaku in Australia and New Zealand distributing their WDXRF, single crystal and protein crystallography systems as well as computed tomography and radiography equipment. For more information on their product lines and other scientific characterisation instruments from a host of international suppliers, please visit www.axt.com.au.